There are two things that Rabbi Benny Zippel really enjoys: One is keeping a kosher diet and the other is eating out. “And for some reason in Utah the two are not easy to combine,” said the leader of Salt Lake City’s Chabad Lubavitch. That was the case before a certified-kosher restaurant opened at Canyons Resort in Park City. Bistro at Canyons is being billed as a “new American kosher bistro,” and the first certified kosher restaurant at any ski resort in the nation. Since it opened in mid-December, hundreds of Jews and many others from Utah and around the globe have found their way into the fine-dining restaurant, inside the Silverado Lodge. “We had to open up the banquet room during our first week, which coincided with Hanukkah, because of the demand,” said John Murcko, the executive corporate chef for Talisker, the company that owns Canyons. But even after the religious holiday, the restaurant — which seats about 75 people — has remained busy. Murcko said some nights the restaurant serves 250 servings. While most are tourists staying at the resort, there’s also Zippel and other local diners. While it may seem odd to have a kosher restaurant in Utah, let alone a ski resort, Murcko said the restaurant is an attractive amenity for kosher travelers who usually must bring appropriate food on their vacations. “Once you understand the Jewish culture, you can see how difficult it is to travel and maintain a kosher diet,” said Murcko, whose wife and boss are both Jewish. Talisker chairman Jack Bistricer, who lives in Toronto and keeps a kosher diet, travels regularly to Utah and other cities with Talisker properties. When Rabbi Mendel Wilmovsky was growing up in Crown Heights, Brooklyn—worldwide home of Chabad Lubavitch, a Chasidic movement of Orthodox Judaism—he never imagined working in the state that’s the worldwide home of another religious movement, and at a ski resort, no less. 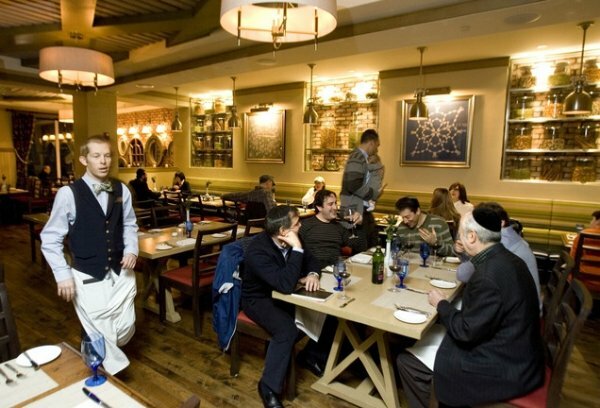 Nevertheless, since December, Wilmovsky and Rabbi Yosef Kirszenberg have been hired to ensure that everything in "Bistro at Canyons" meets those strict standards. “I didn’t know what to expect, but so far things have been great,” says Wilmovsky, who goes by “Rabbi Mendy” and wears a yarmulke with the Canyons logo on it. His job is to make sure the staff, most of who came in unfamiliar with Jewish dietary laws dating back to the Old Testament, are keeping things kosher: acquiring food from kosher producers, and doing the cleansing, cooking, service, etc., appropriately. “In the beginning, it was difficult, but [the staff] was eager to make it work,” Wilmovsky says. The staff estimates approximately 30 percent of diners may not be Jewish, but come in to enjoy unique gourmet creations, such as an appetizer of sliders with homemade tomato jam, a main course of beef-cheek gnocchi and a dessert of panna cotta made with coconut milk. That attention to detail has earned Bistro at Canyons a COR certification from the Kashruth Council of Canada, an organization that certifies more than 1,000 facilities and products. While those high standards appeal to observant Jews, they also resonate with Muslims, who follow a similarly strict Halal diet. More and more people also see kosher food as a safe alternative to mass-produced foods and bacteria-related outbreaks. “A lot of people want to eat a kosher diet because of its standard of cleanliness and the humane way the animals are raised and killed,” Murcko said. The menu served Monday-Thursday at Bistro looks like any other fine dinning establishment, with prime-cut steaks, chicken served three ways, grilled ahi tuna, hand-made gnocchi filled with braised beef cheek, and even a house-made pastrami sandwich. Rabbis Wilmovsky & Kirszenberg also preside over religious services in a small synagogue located next door to Bistro, in the Silverado Lodge. After Friday-evening Sabbath services, everyone adjourns to Bistro for a prix fixe, one-seating meal, a five-course Sabbath dinner that includes traditional Jewish foods such as gefilte fish and kugel. Credit-card orders aren’t processed until after the Sabbath ends, and all electronics in the restaurant are turned off. “These are dishes that they are accustomed to eating, but we are preparing them in a way that’s more exciting,” said chef de cuisineZeke Wray. One thing you won’t find on the menu is butter, cream or cheese. To avoid possible mistakes, the restaurant decided to completely eliminate dairy from the menu, Wray said. Chefs use olive oils and nut butters to add fat — and flavor. And diners hardly notice.